One periodic delay is created to execute a callback function. This will toggle LED1 every 500 ms.
Another periodic delay is created to execute a different callback function. This will toggle LED2 every 1000 ms. The third example shows you how to implement delays by reading the Timer System Service values directly. This will toggle LED3 every second. 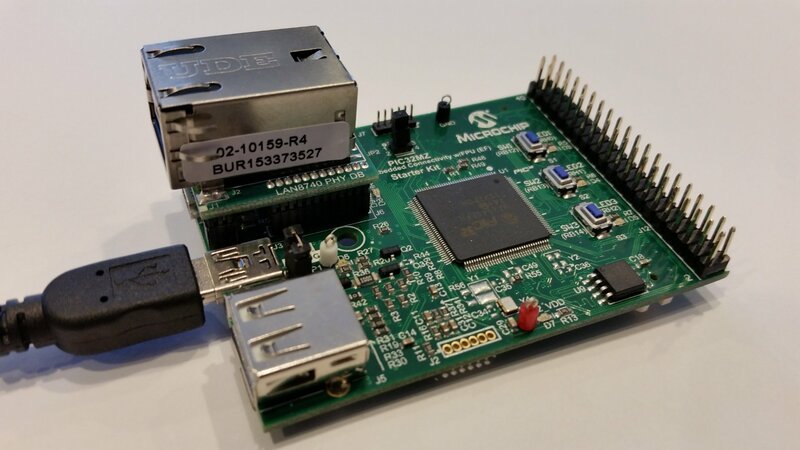 This project uses the PIC32MZ Embedded Connectivity with FPU (EF) Starter Kit. The three LEDs on the board are connected to PIC32 General Purpose I/O Port pins. The Ports Peripheral Library "Pin toggle" function is used to change the state of the LEDs. The "Project and Source Files" download (see below) contains a fully functional project. It can be used as an example and requires no modifications. To gain a deeper understanding of how to use the MPLAB® Harmony framework, we recommend you generate the project and source files yourself by following the step-by-step procedure below. The contents of the following zip file need to be placed in this directory. If this is not done, the MPLAB X IDE will not be able to find all source files, and the project will not build successfully. The "Project and Source Files" download provides a fully functional project. It can be used as an example and requires no modifications. The following steps below provide instruction on how this project was created. The Target Device used on the PIC32MZ EC with FPU (EF) Starter Kit is the PIC32MZ2048EFH144. 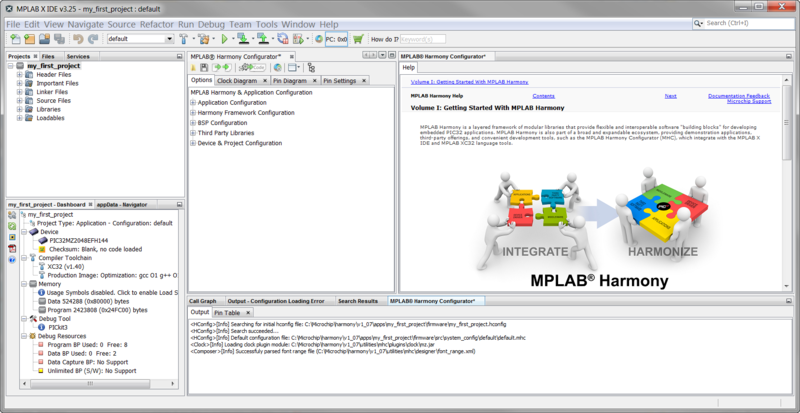 Before you create a new "MPLAB® Harmony Project", you must install the MPLAB Harmony Configurator (MHC) graphical user interface. This GUI enables you to easily add and configure the Harmony library files needed for your application. It also enables the MPLAB X IDE to create a new "MPLAB Harmony Project". (or click in the toolbar). Select the Microchip Embedded category if it is not already selected. From the Projects list, select MPLAB Harmony Project. 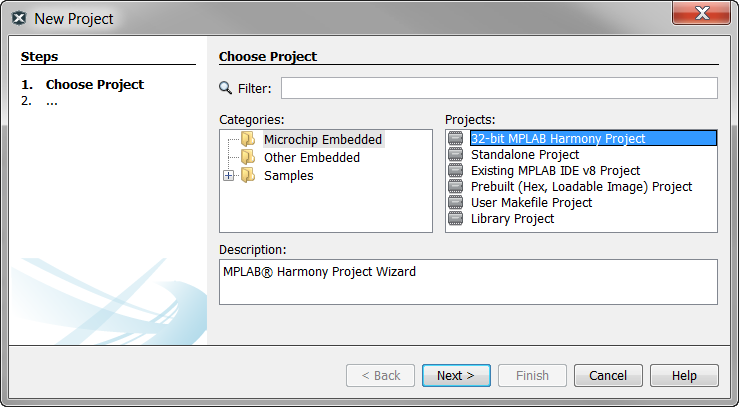 If you do not see the "MPLAB Harmony Project" option you have not installed the MHC. Click here for instructions. The next window should have the default Harmony Path, Project Location and Project Path already selected for you. Remember the MPLAB® Harmony framework expects to find specific files in specific locations. Do not change these default paths because the project may not build. (Optional) Change the project configuration name or just use "default"
After you click Finish, your new project will be opened. To view the following video full screen, click on the video title (view on YouTube). The MPLAB® Harmony Configurator (MHC) plug-in must first be installed into the MPLAB® X IDE before creating an MPLAB Harmony Project. Click here for instructions on how to do this. This video will show you how to create an MPLAB® Harmony Project in the MPLAB X IDE. For details on how an MPLAB Harmony Project differs from a typical "Standalone Project", click here. Expand the "Device and Project Configuration" and "PIC32… Device Configuration" menus to see the Device Configuration Register menus. Expand the DEVCFG0 register menu, and change the setting as shown in this graphic. 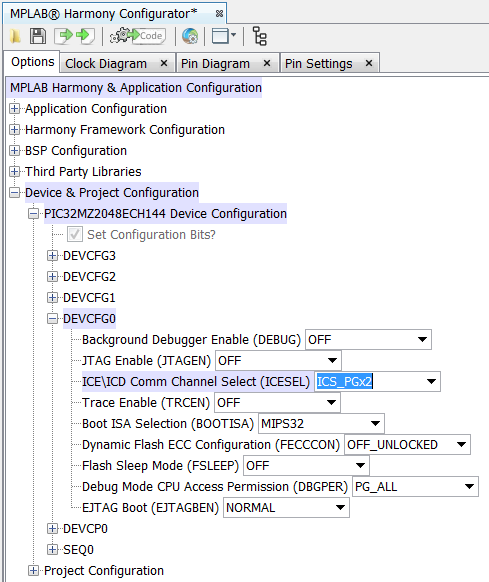 This option controls which pins the PIC32 uses for In-Circuit Serial Programming (ICSP) while debugging. This is a "don't care" for programming. Note how the menu is highlighted, showing a change from the default value. Click on the Clock Diagram tab. Verify the the System PLL output is configured for 200 MHz. 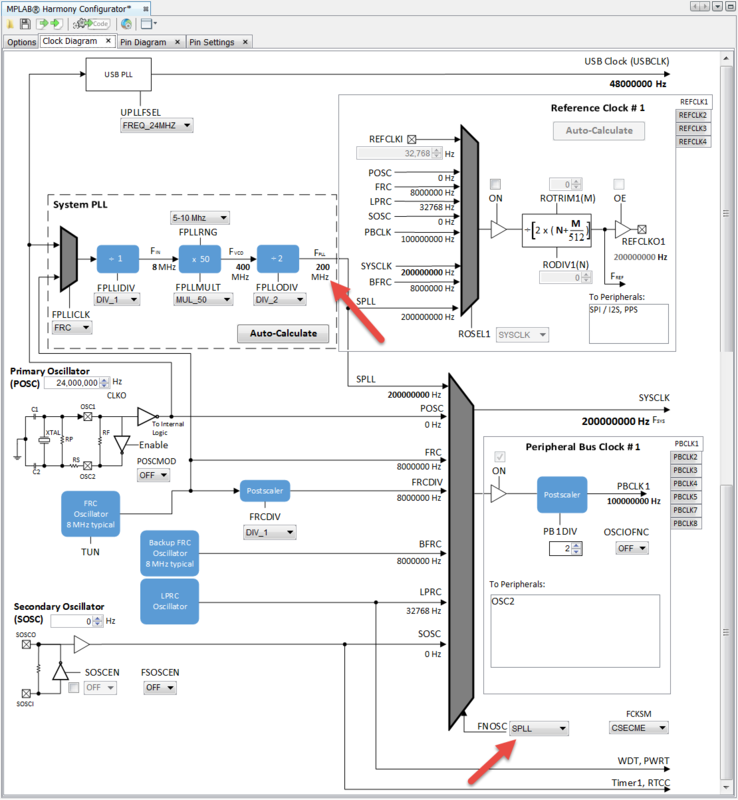 Verify the oscillator selection (FNOSC) is configured to use the System PLL (SPLL). 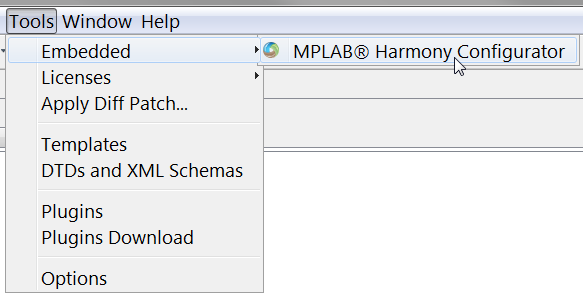 Click on the Options tab in the MPLAB Harmony Configurator window. Check the box beside "Use Timer System Service?" You will use the default values. No other changes are needed. The "Timer Running Frequency" controls the increment rate for the System Timer counter (1000 Hz = 1 System Timer tick every 1 ms). The "Internal Time Units (Hz)" controls the decrement rate for the alarm delay period countdown timers (10,000 Hz = 10 decrements per 1 ms). Note how the MHC configuration tree is highlighted to show a change from MHC's default value. The Timer System Service Library is a client for the Timer Driver Library. Checking the "Use Timer System Service?" box will also automatically check the "Use Timer Driver?" box (found in: Harmony Framework Configuration > Drivers > Timer) for you. This is MHC's default setting when the Timer System Service is enabled, so this change is not highlighted. Three PIC32 I/O Port pins will be used to blink LEDs on the board. The LED on and off time will correspond to your requested Timer System Service periods (you will create three of them). 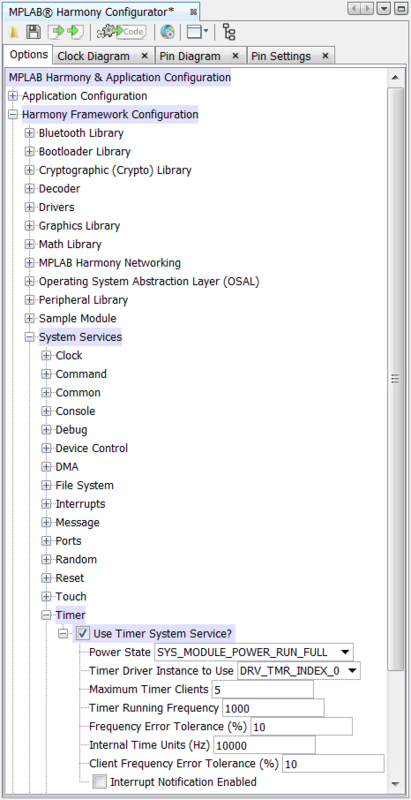 Click on the Pin Settings tab in the MPLAB Harmony Configurator** window. The pins are listed by ascending pin number by default. To list the pins by their I/O Port names, change the pin listing order from "Pins" to "Ports". Scroll down the list to find the pins listed in the table below. These I/O Port pins are connected to the LEDs. Note all I/O Port pins are configured as inputs by default. To use an I/O Port pin as an output, it must be configured as such. Change the pin direction from "In" to "Out" by clicking on the button. Also, note all pins with an analog capability are configured as analog by default. To use an I/O Port pin as a digital pin, it must be configured as such. Change the pin mode from "Analog" to "Digital" by clicking on the button. Click on the MPLAB® Harmony Configurator tab, then click the "Generate Code" button. Click the "Save" and "Generate" buttons on the following windows. Open the app.h file, and add the APP_STATE_IDLE enumeration. After the application is initialized, it will transition to this state. You could have defined these in the application header file (app.h), but defining them in the system configuration header file (system_config.h) allows these macros to change if you plan on using different hardware platforms. The MPLAB X IDE allows one project to support multiple hardware platforms through the ability to include or exclude source files from the project based on the project configuration. The MPLAB Harmony Framework uses this ability to include all source files in one system_config folder while excluding all others (if others exist). Create the callback functions that will be executed when the alarm timer periods expire. Connect your PIC32MZ EC with FPU (EF) Starter Kit to your computer with a mini-B USB cable. This single cable is used to power the board and to connect to the on-board programmer/debugger. See "▶ Show Hardware Setup" in the "Materials" section above to see a picture of the connection. The mini-B USB connector found under the RJ-45 connector is used for USB-to-UART serial communication, not for programming and debugging. 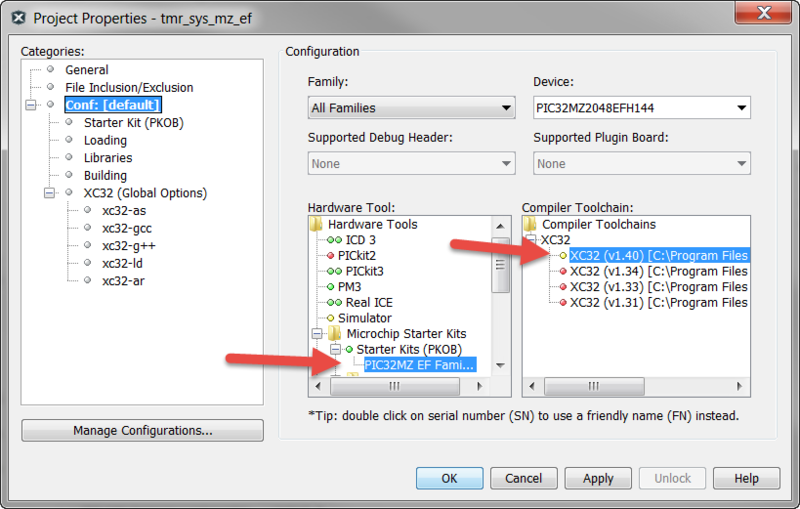 Open the Project Properties window and select the "PIC32MZ EF Family" Starter Kit and XC32 (v1.40) compiler version as shown. If a newer compiler version is available, try using that version first. Click the "Run" icon to build, program and run your project. After successfully building your project and programming your development board, you will see three LEDs blinking. LED3 blinks at the same rate as LED2. This System Tick counter is read every APP_Task loop to determine if one second has passed. If it has, LED3 is toggled. You have successfully used two implementations of the Timer System Service. Both create periodic delays. There are other Timer System Service implementations that allow one-shot (single) alarm delay periods.